In the Backlink Gap tool, you can compare the backlink profiles of up to five competing websites at once. 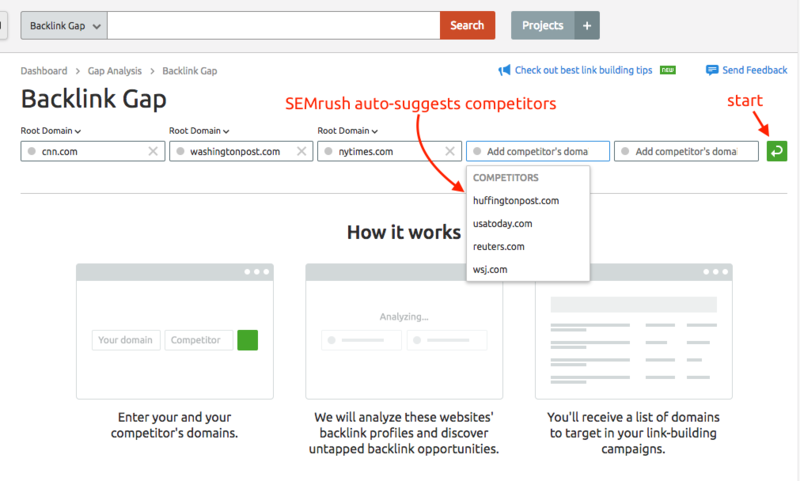 Enter the domains and SEMrush will list all of the referring domains that are sending links to these sites. Filtering makes it easy to identify the websites that are linking to your competitors but not you. 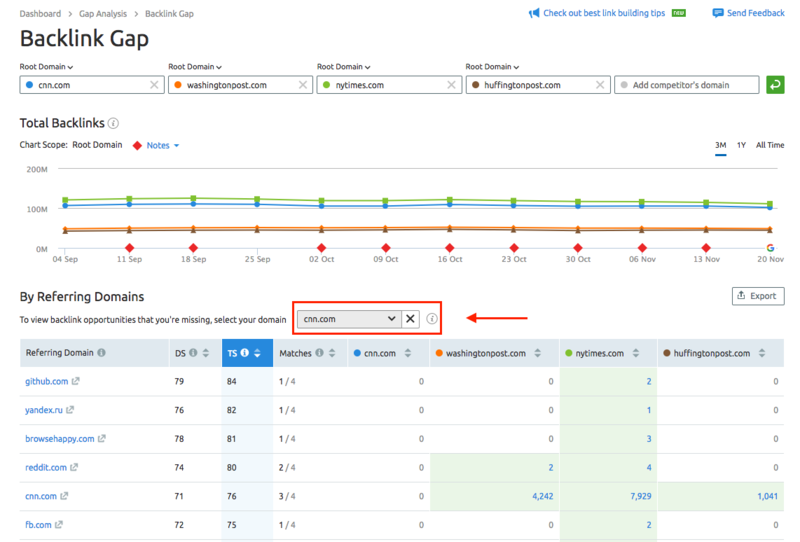 This helps SEOs identify gaps between competitors’ link building strategies and plan their own outreach to build links. To get started with this report, you’ll need to enter the websites of multiple competitors. If you want to be able to find backlinks that your competitors have but you don’t, be sure to enter your domain in one of the input fields. There are a few ways to pick out competitors to add to the report. After you’ve entered your domain, you can click your mouse in one of the input fields to see auto-suggested competitors (sourced from our Backlinks Competitors report). You could also use the Organic Competitors report if you wanted to look for more of your organic search competitors. Competitors added can be root domains, subdomains, or URLs. This means you can compare multiple subdomains or URLs on the same domain, compare a subdomain to a domain, a subdomain to a subdomain, a domain to a URL, or any other combination in between. After entering your competitors in the input fields, start the tool with the green button. The tool will present a graph and a table depicting the comparison between competitors’ backlink profiles. You can get a quick look at which competitor is building the most backlinks with the trend graph at the top. You can switch the time frame to view the number of backlinks over the past 3 months, past year or all time. You can see any major notes from SEMrush or Google that may have had an effect on the number of backlinks for that given day. The table directly below the chart will show you all of the referring domains that send backlinks to the websites entered. This data is sourced from our Backlink Analytics. Authority Score: Authority score is a compound metric that scores the quality of a given domain. Matches: Matches tell you the number of analyzed domains that this referring domain is linked to. These matches are based on the domains you are analyzing. Referring Domains: You can narrow down the list of referring domains by filtering out to a specific domain. To do this simply click on the drop-down menu just above the table. To see the referring domains that send the most links to your competitor, use the up/down sorting arrow in your competitor’s column. The “Matches” column indicates how many of the competitors have a backlink from the listed referring domain. This is an easy way to tell whether a website is a popular source of links among your niche, or if it only has a relationship with one of your competitors. Referring domains that match with multiple competitors can be identified as good outreach targets, since they link to more than one site in your niche. A referring domain that only matches with one competitor could potentially be less likely to link to you. However, it could also be a good outreach target because a link to your site that your competitors don’t have would help you stay ahead of them in the SEO game. To view the backlink opportunities that you’re missing (the referring domains that your competitors have links from but your domain does not), select your domain in the drop down above the table. These websites could be your next link building targets, since they are linking to your competition but not your website. At this time, the trend graph can only display a visual comparison between different domains. If you are comparing multiple subdomains from the same domain, the trend graph will not be able to plot the backlink trends of each subdomain. 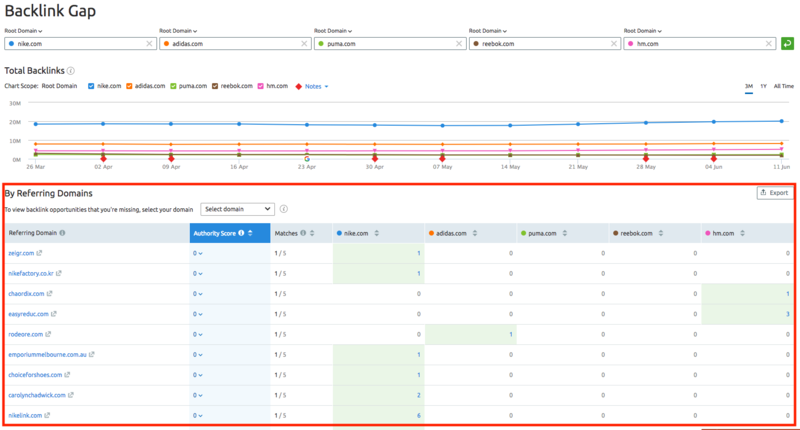 For a quicker way to compare the backlinks of up to 200 URLs at once, you can use the Bulk Backlink Analysis (Quick Batch) report or our public API (API is available with a Business level subscription to SEMrush). And if you are interested in more ways to outperform the competition, enjoy our "How to Benchmark Opportunities for Growth" quick guide.